These gauntlets, or gloves, are made of steel damascened with a design of military trophies, palm branches and wreaths, referring to their military associations. The technique of damascening uses gold or silver to decorate a base metal such as iron or brass. 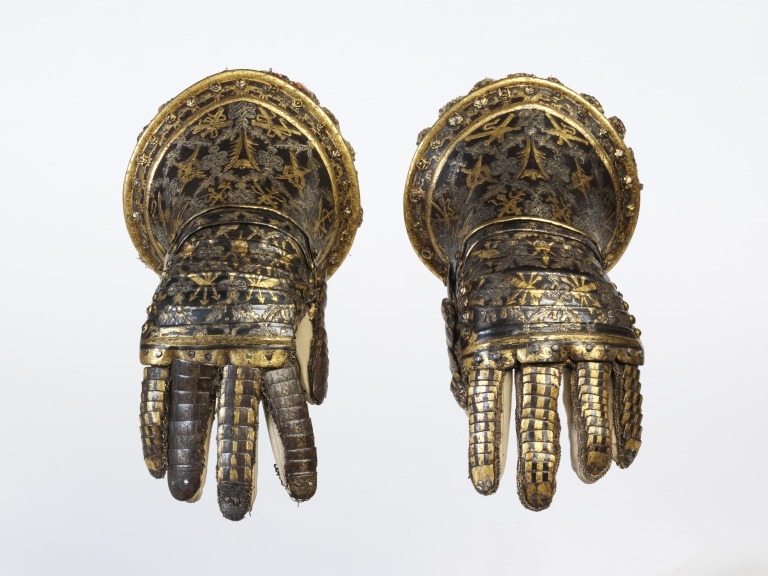 The gauntlets are thought to be part of a set of three armours made for the sons of Philip III of Spain. Very grand, costly armour was part of the equipment for a prince or noble of this period. This armour used gold and silver as well as a beautiful crimson silk velvet lining with gold and silver embroidery. Steel damascened with military trophies, palm branches and wreaths in gold and with foliage and knots in gold and silver, lined with crimson silk velvet embroidered with gold and silver thread. These steel gauntlets are decorated with palm branches, laurel wreaths, weapons and trophies alluding to their military associations. These associations however are merely symbolic. The gauntlets were not designed to protect the hands but to project an image. They probably come from one of three identically-decorated parade armours commissioned for the sons of King Phillip III of Spain in around 1614. The armours survive in the Royal Armouries in Madrid. The gauntlets are thoroughly international in their decoration and style. The gold and silver has been applied using damascening, a technique European craftsmen imported from counties to the east such as Syria (Damascus), Egypt and Turkey. Decorating candlesticks, bowls and armour alike, this method involves inlaying gold and silver wire into engraved channels on the surface of the metal. In Europe this generally took the form of an overlay, as on these gauntlets, but the effect is much the same. Damascening came to Europe via Venice and was a particular favourite of the armourers of Milan. 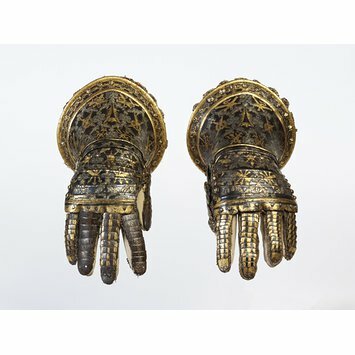 The Madrid armouries contain a number of damascened Milanese armours which may have provided a source of inspiration for these gauntlets and their associated armours. The gauntlets evoke continuation rather than change at the start of the seventeeth century. They are from the last great period of the all-over body armours commissioned by noblemen for no purpose other than to impress. Recent art history has tended to separate armour and weapons from art. It assumes that all armour is primarily utilitarian and that the violence and blood-letting with which it is associated is the antithesis of taste and style. The centrality of military subjects to the privileged fields of painting and sculpture however might suggest otherwise. The Museum bought the gauntlets in 1888 from the Londesborough Sale for £183.15.0. Historical significance: The gauntlets probably come from one of three identically-decorated parade armours commissioned for the sons of King Phillip III of Spain in around 1614. Armour was purpose-specific. Parade armour was ostentatious and showy, governed by the same aesthetics that shaped, distorted and adorned contemporary clothing. The armours associated with these gauntlets were designed to be worn with rich velvet hose and silk stockings which combined to create a single outfit. Brightly coloured plumes atop the helmet completed the impression of other-worldly magnificence. A very rare survival on these gauntlets is the crimson silk velvet lining decorated with gold and silver thread. Its presence provides a soft contrast to the hard steel and reminds us that the combination of rich fabrics and virtuoso metalworking turned the armoured body into a work of art. Patterson, Angus, Fashion and Armour in Renaissance Europe: Proud Lookes and Brave Attire, V&A Publishing, London, 2009, ISBN 9781851775811, p. 52, ill.
Patterson, Angus, "Power and Glory", chapter, in Medlam, Sarah and Miller, Lesley Ellis, Princely Treasures: European Masterpieces 1600-1800, exhibition catalogue, V&A Publishing, 2011, ISBN9781851776337, p. 46-7, ill.